The highly respected Journal of Prosthetic Dentistry published a second study on the long-term survival rate of Prettau® Zirconia full-arch bridges in March of 2018, again validating the exceptional success rate of the Teeth Tomorrow® protocol. 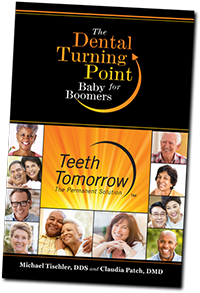 was authored by Michael Tischler, DDS, Claudia Patch, DMD, and Avinash S. Bidra, BDS, MS to address the limited data available on the clinical outcomes of patients replacing traditional removable dentures with non-removable full-arches of teeth supported by dental implants. 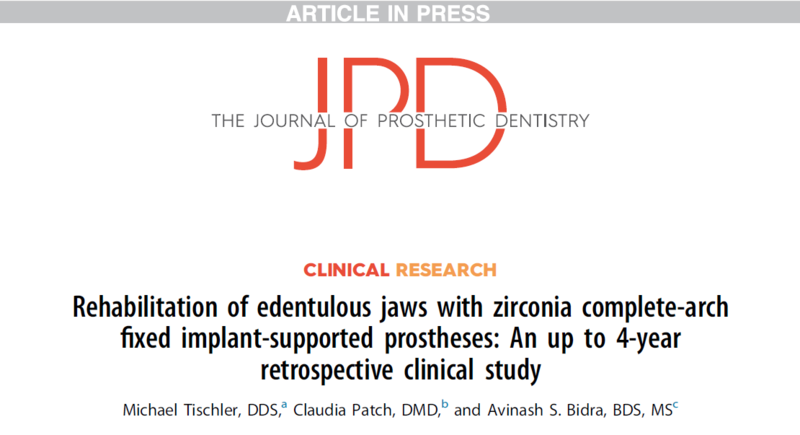 The study focused on 128 patients without teeth rehabilitated between January 1, 2013 and December 31, 2016, with a total of 191 upper and lower Prettau® Zirconia full-arch bridges supported by a total of 1072 dental implants. The results demonstrated an amazing Cumulative Survival Rate (CSR) of 99.4% for the Teeth Tomorrow® bridges, and a 97.6% CSR for the implants. All full-arch implant supported bridges are not created equal. This study demonstrates the clear survival advantage of the Teeth Tomorrow® Prettau® Zirconia full-arch bridge over other solutions that deliver acrylic hybrid bridges as the final product. These composite bridges made with acrylic gums and denture teeth (even when supported by a titanium bar that connect to the implants) are notorious for chipping, breaking, cracking, and losing teeth. A recent comparison of the Prettau® Zirconia bridges used by Drs. Tischler and Patch versus acrylic bridges delivered using the NobelGuide®All-on-4® Treatment yielded some enlightening results* – Nearly 1 in 4 patients receiving acrylic bridges experienced chipping, breaking or cracking that resulted in the final bridge needing to be replaced. The March 2018 Study by Tischler, Patch & Bidra reported only 1 of 191 bridges required replacement. The Prettau® Zirconia dental implant bridge produced by Tischler Dental Laboratory is the final prosthesis delivered by advanced implant dentists in the Teeth Tomorrow Network. – An affiliation of highly credentialed practices delivering the Teeth Tomorrow® procedure in exclusive territories throughout the country. *Lopes A, Maló P, de Araújo Nobre M, Sánchez-Fernández E, Gravito I. The NobelGuide® All-on-4® Treatment Concept for Rehabilitation of Edentulous Jaws: A Retrospective Report on the 7-Years Clinical and 5-Years Radiographic Outcomes. Clin Implant Dent Relat Res. 2017 Apr;19(2):233-244. doi:10.1111/cid.12456. Epub 2016 Oct 18. PubMed PMID: 27758069.